In mobile ad hoc peer-to-peer (M-P2P) networks, frequent network partitioning occurs due to peer movement or owing to peers switching ‘off’ their mobile devices. This leads to typically low data availability in M-P2P networks, thereby necessitating data replication. 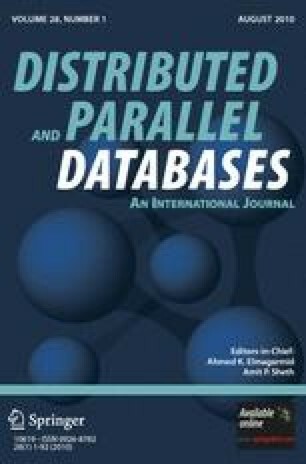 This work proposes E-ARL, which is a novel Economic scheme for Adaptive Revenue-Load-based dynamic replication of data in dedicated M-P2P networks with the aim of improving data availability. Thus, E-ARL considers a mobile cooperative environment, where the MPs are working towards the same goal, and the network performance is facilitated by the economic scheme. E-ARL essentially allocates replicas based on its economic scheme. Each data item has a price in virtual currency. E-ARL requires a query issuing peer to pay the price of its queried data item to the query-serving peer and a commission to relay peers in the successful query path. The main contributions of E-ARL follow. First, it uses an economic scheme for efficiently managing M-P2P resources in a context-aware manner by facilitating effective replica hosting and message relaying by peers. Second, it collaboratively performs bid-based replica allocation to facilitate better quality of service. Third, it incorporates both revenue-balancing and load-balancing to improve peer participation and performance. Fourth, it conserves the energy of low-energy MPs to facilitate network connectivity. Our performance evaluation shows that E-ARL is indeed effective in improving peer participation in M-P2P networks, thereby improving query response times, query success rates, query hop-counts and replica allocation traffic. Part of this work was done when Anirban Mondal was at the University of Tokyo, Japan.